There is a constant need for innovation in the tablet market and, to be fair, a lot has been happening in the past couple of years, but LeapFrog seems to be taking things to a whole new level. If you’re not familiar with LeapFrog, they specialize in developing interactive learning systems for kids. This is, essentially, what their tablets are – they’re more than just mobile devices, they are learning tools for children. LeapFrog doesn’t produce “traditional” tablets, they are focused on combining physical books with technology. As most parents don’t want their kids spending time staring at computer screens, playing useless video games to keep themselves occupied, LeapFrog’s products are, in many ways, revolutionary. This company is best known for their award-winning tablet for kids LeapPad. Their latest product, LeapStart is a step forward in originality, design, and functionality and while not a perfect tablet for kids, it is probably the best product of this type available on the market today and a powerful learning tool. Before getting further into the review of the tablet itself, let’s briefly focus on how LeapStart works. 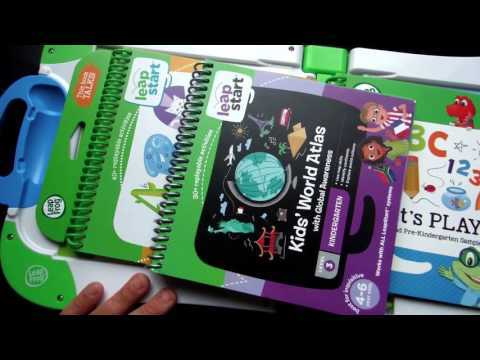 LeapStart is a folding plastic case into which parents can insert one of 16 books, each meant to assist and tutor a child in maths, literacy, science and problem-solving. A cleverly designed stylus is connected to the case by a cable and the child can use it to touch the book, therefore activating built-in triggers, while the tablet gives them clues, produces sounds, sets puzzles, asks questions and plays engaging audio, encouraging the child to play and learn more. The concept itself is wonderful, although the execution perhaps could have been a little better, but we will get to that in a bit. The LeapStart is available for two different age groups. The Preschool System is focused on children aged 2-4, while The Primary School System is meant to assist and entertain children between the ages of 5 and 7. Both of these systems are meant to prepare the child for school, as well as teach the child valuable skills in solving real-life problems. The LeapStart meant for pre-schoolers teaches children ABCs, counting and gently introduces maths, communication and social skills for preschool. Obviously, the primary school version is more advanced and introduces logic, conversation, reasoning, advanced problem solving and more. As expected, the LeapStart is solid and robust and should remain intact even if a child drops it countless times. The stylus is specifically designed to be held by children. It lays in a child’s hand comfortably and is made out of thick plastic. Aesthetically, the device looks colourful and vibrant, yet simple and perfectly appealing to young children. What could be problematic for some kids and a concern for parents is the tablet’s weight. The pre-school edition weighs 1.98 pounds, while the primary school one weighs about 2.10 pounds. Whether this was meant as an introduction to physical education lessons is unclear, but this can definitely prove to be a concern for many parents, even though the device itself is perfectly safe to use. Possible weight concerns aside, LeapStart seems to have already become a hit among parents, if not yet children, at least according to numerous online user reviews. Most call the device simple, easy to use, entertaining for children and, most importantly, a good educational tool. From a broader perspective, devices like LeapStart may prove to be the next step in technological development when it comes to mobile technology made exclusively for children. On top of that, the product itself is definitely affordable but, as always, there is a catch. There have been reports of parents complaining about the content of this system – the books themselves. The content of the books, however, is not the problem, quality is not the issue, but quantity seems to be. There are 16 books available, in different categories and for different educational levels, and each of them cost about the third of how much the device itself is priced. Overall, the LeapStart is a powerful educational system for children that will keep your toddler or your pre-schooler entertained, while at the same time providing valuable lesson and introducing the child to education in a simple and fun, yet efficient way. There is, however, room for improvement. Hopefully, the next generation of LeapFrog’s educational systems will be lighter. The kids will, most probably, be satisfied and entertained, while the parents may cringe at the prices of additional books. But, to be fair, you will get your value for money if you decide to purchase LeapStart and your child will most certainly have fun and learn at the same time with this tablet for children. From a different perspective, LeapStart, if it turns out to be as successful as its predecessor, might pave the way for similar products to emerge on the market, which might be something techies among parents might be interested in and hopefully, soon enough, their children too.